On this side you find all our product categories for the BMW R1200R ✅. 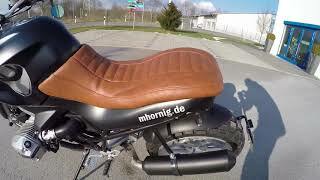 This motorcycle is a classical Roadster or rahter Nakedbike with 109 HP. Thanks to the flat enginge it convinces with easy handling and low emphasis. 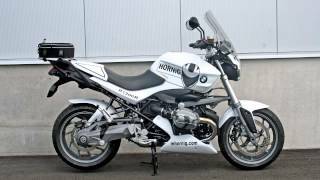 The BMW R1200R was chosen as best Tour Motorcycle several times and it has the title Alpme King. This bike is also known as R12R or 1200R. In the category Alu, Hight-grade Steel you can find suitable products for your R1200R like oil filter plugs, Cylinder protectors, Crashbars, BMW R1200R Centre cap top yokes and more. Our Windscreens offer many options to optimize the wind protection. We have Tank Bags, Duffel Bags, Tail Bags, Inside Bags, Topcases and others. For more power and a better sound check our our category Exhausts. In section Carbon, CFK we have, among other things, engine spoilers, rear huggers, number plate deflectors. Other suitable products are LEDs and Indicator lenses which can be combined with a special bulbs. We have Navigation Systems by TomTom and Garmin as well as the Intercom System Inerphone with Bluetooth. 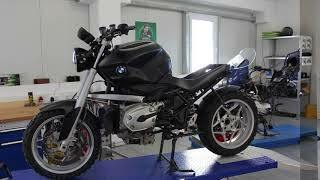 Certainly we have Spares and Waring Parts for your BMW R1200R in our assortment, like engine oil, transmission oil, break disks, batteries, oil filters, sparking plugs, air cleaner and break pads. We habe Tools and Accessories like battery chargers, cables, plugs, main stands, paint protection, pocket lamps and clothes.